With the Galaxy Note 9 release officially here potential buyers are weighing all of their options. If you’re still using an old Galaxy Note 5 you have plenty of new phones to choose from. After the Note 7 recall, you probably kept the Note 5 and still use it today. With that in mind, this guide will go over everything you need to know about the all-new Galaxy Note 9. Then, we’ll compare it to the Galaxy Note 5 so you know what to expect. Samsung’s latest phablet has two cameras on the back, a huge 6.4-inch screen, and lots of software enhancements. And While the Galaxy Note 5 is still a great phone, it’s more than a little outdated and probably out of space. Newer Samsung phones are water-resistant, have microSD cards, and vastly improved cameras. Our slideshow below will tell you why the Note 9 is worth the upgrade. If you’re still using the Galaxy Note 5 chances are you’re considering an upgrade. And while the Galaxy S9 and Galaxy S9+ earlier this year were enticing options, Samsung’s new Note might finally have enough upgrades to make it worth the switch. It’s bigger than ever before, faster, has a huge battery, and it received new S-Pen features for the first time in a while. Typically the choice is just about getting the latest specs or a bigger screen, but there’s a lot more to this upgrade cycle. Mainly because the Note 5 is nearly three years old, and we don’t think it’ll get the Galaxy Android Oreo update. As a result, you have a phone that’s missing a lot of key features. Key features you’ll get from the Note 9. Our link above goes over some cool things the Note 8 can do. 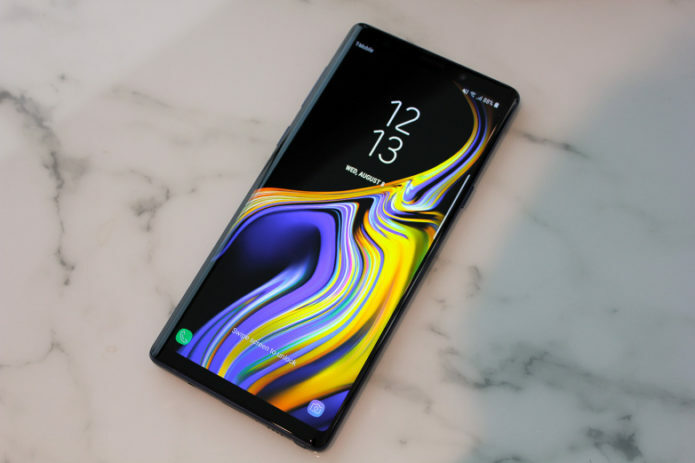 Samsung’s latest Galaxy Note 9 is similar and has even more to offer. For those of you on the fence, we want to help you make the right decision. Here we’ll compare the older Galaxy Note 5 to the Galaxy Note 9 for you. Additionally, we’ll explain what makes it worth buying or if you’ll be better off just getting a Galaxy S9+ instead. The first and biggest difference is the display, but you already knew that. The Galaxy Note line is always Samsung’s biggest and best smartphone. Samsung’s Galaxy Note 5 has a 5.7-inch Quad HD display. It looks great and all, but it’s actually the smallest screen out of any high-end Samsung released in the last few years. The Galaxy S9 is 5.8-inches, the Galaxy S9+ is 6.2-inches. And now the new Galaxy Note 9 is even bigger, coming in at 6.4-inches. It’s pretty massive. However, physically, it isn’t much bigger than the Galaxy Note 5. And, it’s not as wide so you’ll be able to easily use it with one hand. So don’t think you’re getting a gigantic phone you won’t be able to hold. Samsung slimmed down the bezels around the screen and removed the home button. As a result, the front is almost all screen. Going from 5.7-inches to 6.4-inches is a big change, but it’s not a difficult one. Both phones have a Quad-HD AMOLED screen that looks gorgeous, only the Note 9 is a few generations better so it’s brighter, has more vivid colors, and works better outdoors. If you can handle the bigger screen, just upgrade. The only big question you need to ask yourself is if you want a curved screen. The display on the Note 9 will curve off the sides of the device instead of laying flat. Some love it, others don’t. Decide what’s right for you. We recommend seeing the curved display at a Best Buy or carrier store before you make the switch. The Note 5 still looks pretty good considering it’s three years old. The back has rounded glass and metal, and it’s very sleek. The Note 9 looks similar, yet vastly different. If you’ve seen a Galaxy Note 8 or even the Galaxy S9 you’ll know exactly what to expect, as the two look almost identical. Honestly, you’d probably be ok if you simply got a Note 8. That said, with the Note 9 you’ll get the same premium all metal and glass design, curved edges, and tons of features. In case you missed it, the Note 9 won’t have a physical home button, it’s gone completely. Samsung moved the fingerprint scanner to the back of the phone. This allows for the bigger screen but makes using the scanner more difficult. As for the actual design, the front and back are curved similar to the Galaxy Note 5 on the back, making it comfortable to hold. It’s also more fragile, so keep that in mind. Aside from the screen, there are three very important aspects of the design you should be aware of. For one, the Galaxy Note 9 is IP68 dust and water-resistant. It can go under 5ft of water for over 30 minutes and work fine. And that includes the S-Pen stylus. The Note 5 is not water-resistant at all. Another important factor is storage. The Galaxy Note 5 only came with 32GB and was that weird year Samsung removed the microSD slot. You’re probably out of space or constantly deleting apps, photos, and videos. How frustrating. The Galaxy Note 9 has 128GB of storage, so 4x as much. Or, you can buy a model with 512GB if you really need space. Not to mention it takes a microSD slot. And finally, it has a massive 4,000 mAh battery, but more on that in a moment. We haven’t even talked about the S-Pen, software, or camera yet. Want one already? Another reason we strongly recommend an upgrade is simply for the increase in specs. The Galaxy Note 5 is nearly three years old, and a lot has changed since then. Here’s a quick comparison. That’s quite the list. You’ll get a bigger screen, tons of RAM, 4x the storage, lots of power, two sweet new cameras and all-day battery life. Convinced yet? Here’s what your Note 5 has. For me, the most exciting aspect of the Galaxy Note 9 is the bigger battery. Even Samsung’s 6.2-inch Galaxy S9+ only has a 3,500 mAh battery, and it lasts plenty long. So, packing a massive 4,000 mAh battery in the phone it’ll last a lot longer than your old Note 5. Way longer, actually. Combine that with all the other changes, and the improvements in Android 8.0 Oreo, and you’ll get a phone you’ll absolutely love. Basically, yes, this is worth the upgrade. Another area where Samsung has improved by leaps and bounds is the camera. They’ve always had some of the best cameras on the market, but that really took off in 2017. The Note 5 has a 16 Megapixel camera and the Note 9 is only 12 Megapixels, that doesn’t matter though. It’s a 12 DualPixel sensor that uses 95% of the pixels to have a laser-fast autofocus, and it captures more light faster. Resulting in crisp and clear pictures in almost any situation. The sensor is bigger too, which improved low light photography. If you’ve enjoyed the camera on the Galaxy Note 5, you’ll absolutely love the Galaxy Note 9 cameras. Oh, and did we mention there are two of them. Samsung’s using a new dualpixel camera array that’s fast, clear, and can take 960 fps slo-mo video. Additionally, the Note 9 features Samsung’s new variable aperture technology. What that means is the aperture can change from f/1.5 to f/2.4 apertures for the best possible photo in any situation, speed, or lighting. Just like how the human eye adapts to its surroundings, Samsung’s camera can do the same thing. Basically, letting in more light for better photos. If it doesn’t need a lot of light it uses a faster aperture for crisp, clear photos. Then, that second lens can zoom in closer on subjects, and help see the depth of field for portrait photos and other imagery. Basically, the Note 9 camera is a good 3-4 years ahead of the Note 5, and worth the upgrade across the board. I used the Galaxy Note 5 for over a year, so I know how average (at best) battery life is. You have a somewhat small 3,000 mAh battery inside the phone. It was the first phone with “fast wireless charging” which helped make up for the small battery. With the Galaxy Note 9 though, you’re getting something completely different. Samsung was very cautious about the battery last year after the Note 7 fiasco, but the Note 9 went all out. This year Samsung threw a huge 4,000 mAh battery into the Galaxy Note 9. The biggest of any Note device ever released. And with an 8-point battery inspection process and outside companies ensuring they’re safe, buy one without worry. Between a huge battery and faster charging, I want one already. Does any of this sound exciting to you? The Galaxy Note 9 will be a significant upgrade for anyone that still uses the Galaxy Note 5. So, when can you get one and how much will it cost? Those are two very important questions. Samsung officially announced the Galaxy Note 9 on August 9th, 2018, in New York City. It’s available for pre-order as we speak, and it’ll hit store shelves around the globe from August 22-24th. The release date is the 24th, but some buyers will get it early. How much? Well, that’s the painful part. The Galaxy Note 9 is $999. Yes, one grand. You’re getting a huge screen, tons of power, 4x the storage, two cameras, a bigger battery and more, so it kinda makes sense. As for the Note 5, you can’t buy it anywhere anymore. It was expensive back in the day, but you probably paid $199 or $249 and signed a contract. It doesn’t work that way anymore. Instead, you’ll probably pay $35-40 a month for the phone for 24 months until you pay it off. The contracts are phone payment plans, not contracts from carriers. Either way, the Galaxy Note 9 is arguably one of the best phones of the year and a great phone to upgrade to.